Size: The main lodge has three bedrooms, a bunk room that sleeps eight and 4½ bathrooms. There are also 10 cabins scattered around the property. This extended family loves to gather together summer-camp style. 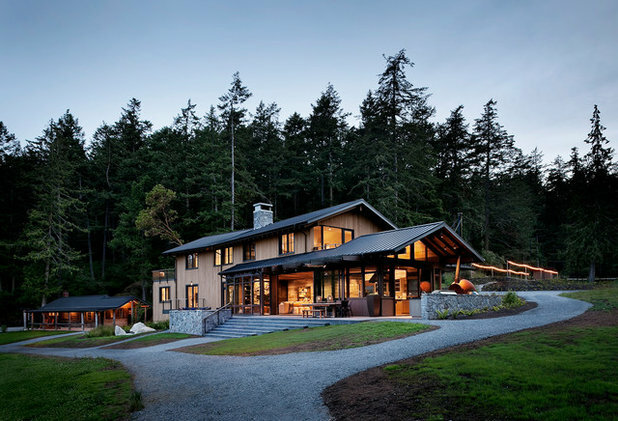 Their property has a new main lodge and 10 existing cabins dotted along the coast of one of Washington state’s sublimely beautiful San Juan Islands. 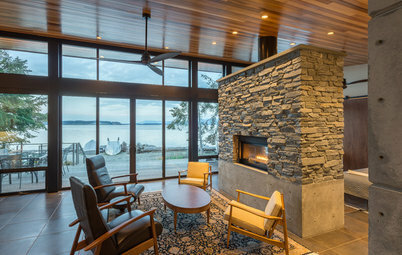 While at first the family looked into remodeling the existing main lodge, it had been added onto piecemeal over many years in a way that gave it a strange layout, was structurally unsound, had unhealthy lead paint and asbestos inside, was too large and its proximity to the shore was non-conforming with today’s shoreline regulations. Six of the cabins had been arranged around a lawn that faced the beach. 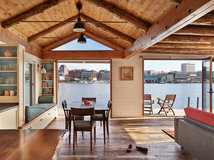 “The existing main house was plunked right in the middle of the lawn close to the shore and blocked the view from several of the smaller cabins,” project architect Rosie Donovan of DeForest Architects says. “We encouraged the owners to build their new main house away from the shoreline to give all of those cabins a view of the water and a better relationship with each other.” This allowed the team to design a “great lawn” gathering area shared by all seven structures. It also allowed them to remove a creosote bulkhead at the shoreline, regrade the land and beach and install new ‘beach nourishment’ rocks and sand at the shoreline to improve the fish habitat, particularly for salmon. The new main lodge is nestled between the edge of the woods and a rocky outcropping, in a natural saddle about 200 feet back from the shoreline. Now the great lawn is shared by six cabins and the main lodge. Donovan adjusted the footprint to avoid the rocks and to work with the slope. “Stone walls serve to ground the house in the landscape,” she says. Inside, the house has level changes that line up with the terraced landscape around it. The result is a modern rustic home with architecture that’s harmonious with its beautiful site and has some fun surprises inside. We’ll be touring the main lodge, where the large groups meet up for meals, family traditions and relaxation. “We joined the project early on to help determine the furniture and finishes that would work well with the architecture,” interior designer James Fung of NB Design Group says. 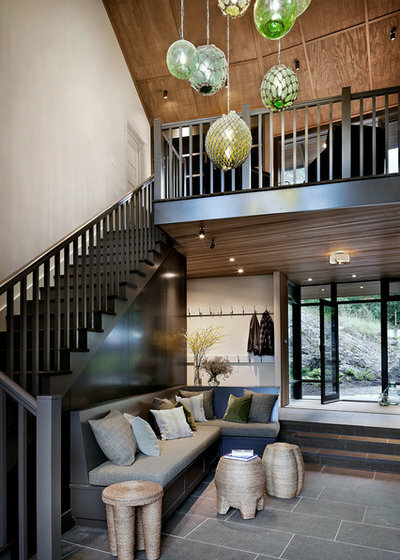 The entry and staircase area introduces the materials palette used throughout the house. 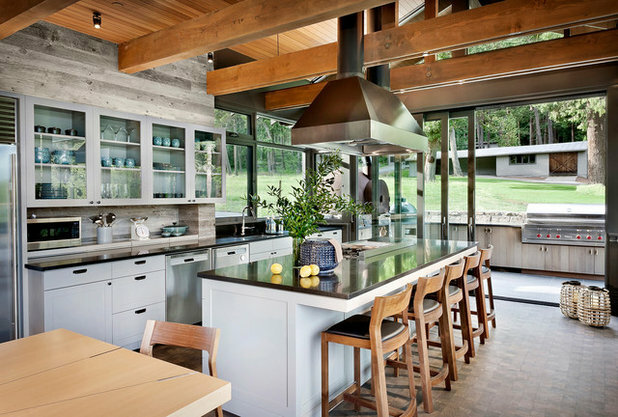 “It was important to these clients that the house be of the Pacific Northwest, using local and regional materials like the stone floor in here,” Fung says. The floors are Black Tusk basalt from Bedrock Natural Stone in British Columbia. This sourcing also reflects the family’s sustainable sensibilities. “We purposefully selected stone from Northwest sources to avoid the shipment of such heavy materials from overseas,” Donovan says. 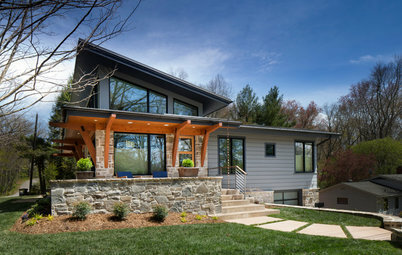 Sourcing materials like lumber, stone, doors and windows from the region helped decrease the carbon footprint while enhancing the feeling that the architecture is of the place. 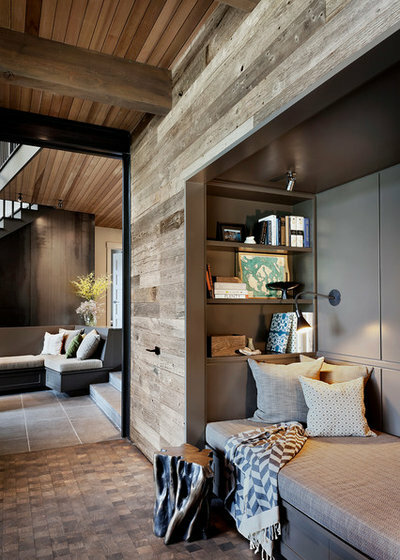 The built-in bench is made for putting on shoes and boots and the area also serves as a message station. The wall behind it is crafted of magnetic ferrous steel. “We imagined this as a place to hang maps, messages and ‘cool things to do on the island today’ guides,” Fung says. The wood on this ceiling is stained clear vertical-grain cedar with a square lap edge. The lower entry ceiling gives the space a more compressed feel, making the way the house terraces down and opens up to the water a dramatic experience. Once past the compressed area, a chandelier made of reclaimed vintage glass marine floats and netting adds a burst of green and draws the eye up to the ceiling on the second floor. “The chandelier is nautical and of the place,” Fung says. The second level’s ceiling is stained select veneer Douglas fir panels from Roseburg. “This material looks like large sheets of plywood, but the surface veneer is rough-sawn like exterior siding,” Donovan says. 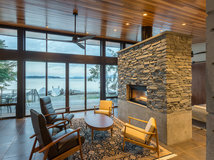 The architecture, including the ceiling beams and another set of steps, guides people down from the compressed entry to a long, open space that opens up completely to the views down the great lawn to the Strait of Juan de Fuca. The beams are Douglas fir. Several of them were milled from trees on the property that were taken down during construction. 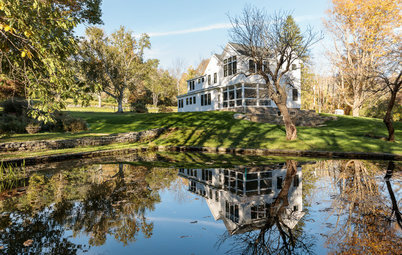 “The landscape is stunning and the climate is temperate, so a connection between indoors and outdoors was really important,” Donovan says. “Large windows and doors opening to the landscape allow for a flow of light, air and activity all year round.” These lift-slide doors are each 8 feet wide, creating a 16-foot-wide opening to the terrace. The doors were made by Quantum Windows and Doors in Everett, Washington. The walls along the steps are covered in reclaimed snow fencing, which has a weathered driftwood look that relates to the surrounding landscape. It was also chosen for its durability. “With all of the people that go through here, the inevitable scuffs and scratches will only add to its appeal,” Fung says. The dark-stained end-grain wood flooring is also very durable. End-grain flooring is composed of blocks cross-cut from timber ends, and it was often used in industrial buildings and even as street paving because it can take a beating. The dining table is a custom piece, large enough to handle an all-camp assembly during mealtimes. It’s a good example of how the design meets the goals of relaxation, tradition and family discussed in the initial workshop. 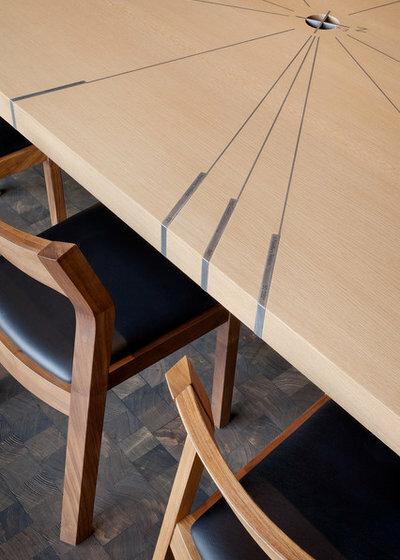 “The table is so large that it needed some detail,” Fung says. The inset metal pieces represent a compass that points to locations significant to the family. Case’s Profile chairs are Danish modern in style. Fung also chose them because they’re stackable. 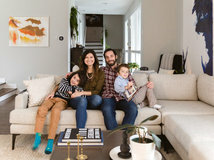 “They fit even more chairs around the table than you see in these photos, so they wanted to be able to store the extras efficiently,” he says. 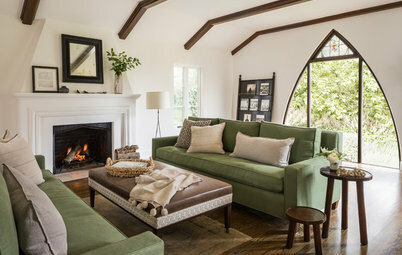 “The fireplace is the heart of the house, a focal point to gather around,” Donovan says. The stone ties in with the stone walls in the landscape, while the hearth is the same Black Tusk basalt used on the entry floor and outdoor terraces. 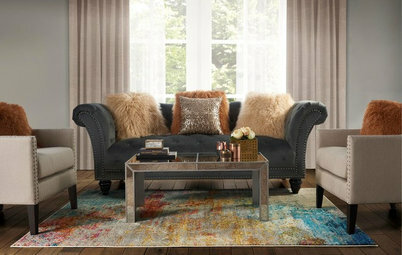 A trio of poufs that fit under the console table and the long hearth provide extra seating. 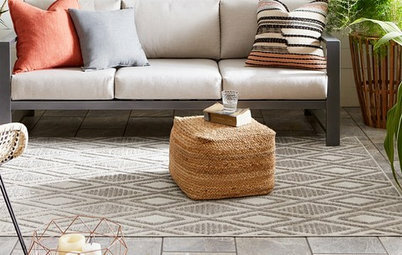 The sofa is covered in an indoor-outdoor chenille that can stand up to damp bathing suits. “This is a big house, but we wanted to create spaces that would still feel intimate,” Fung says. 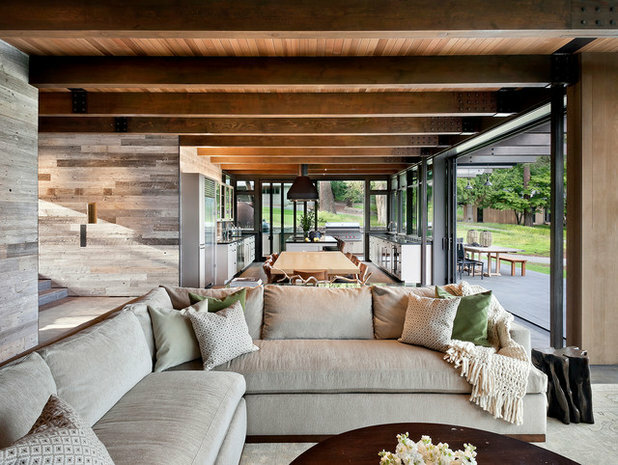 The planked ceiling and fireplace create a warm ambiance, while the large sectional sofa and a reading nook to the right offer cushy comfort. 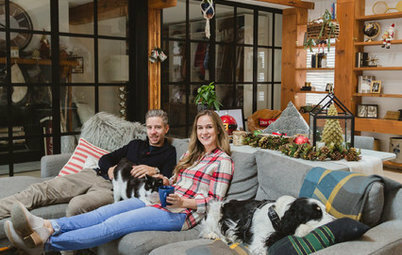 There are industrial touches mixed in as well — the shelves to the left of the fireplace are ferrous steel like the entry bench wall and the console table is made from a reclaimed wooden conveyer belt. 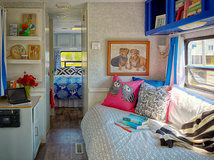 The reading nook contains a twin-size mattress for an extra overnight guest, and features built-in storage and reading lights. Just past the nook, the black door handle is the only clue that there’s a door in the wall of reclaimed snow fencing. It opens to a closet that houses the extra dining chairs. The entire open space containing the living room, dining room and kitchen enjoys uninterrupted views to the water, thanks to a glass wall composed of large windows and doors that open to the outdoor living spaces. 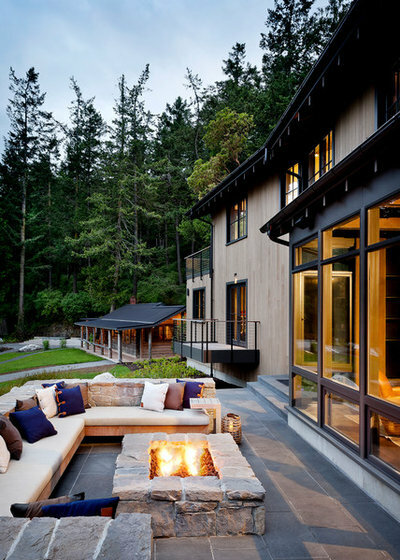 On this water-facing terrace, the designers created seating around the fire pit to handle a big group. The stone patio is the same Black Tusk basalt used in the entry and on the fireplace hearth. The stone walls around the house are a mix of Whistler Basalt, Mountain Chalet Rhyolite and Camas Gray in a dry-stack rubble pattern. This photo also gives us a good look at one of the cabins on the property that inspired the architecture of the main lodge. This one is 860 square feet and has one bedroom. 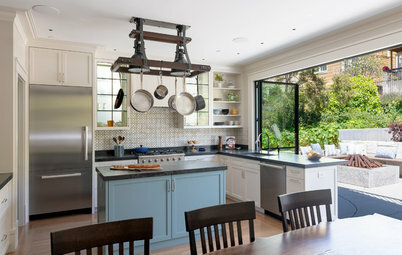 Another large set of doors opens the kitchen up to the outdoor grilling area, which includes a large pizza oven fashioned from a salvaged steel buoy. 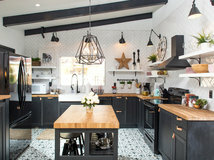 The countertops in the indoor and outdoor kitchens are Absolute Black granite. The snow fencing continues along the cabinetry wall, while exposed trusses and a large steel vent hood add industrial flavor. 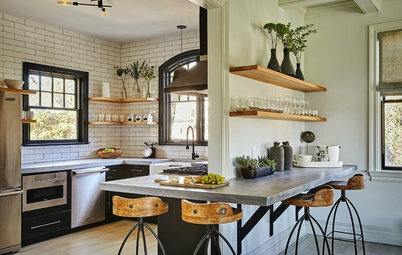 The quieter countertop and subtle cabinet paint colors let the wood elements in the room take center stage. 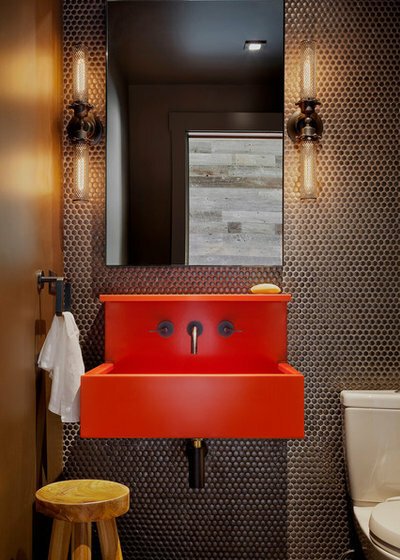 Opening the door to the powder room reveals a collection of playful surprises: matte bronze penny tile wall, industrial-style sconces and a custom-made red powder-coated sink. 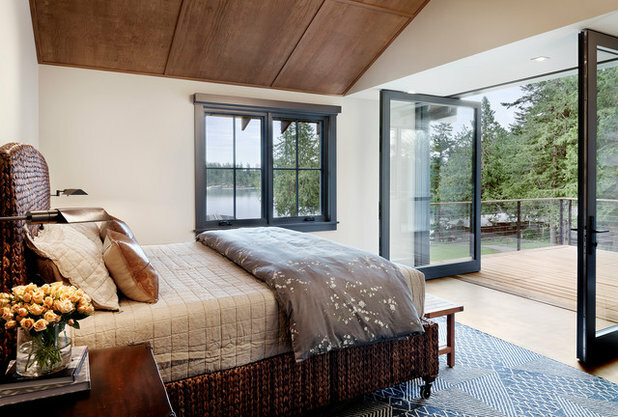 Upstairs, the master bedroom features a vaulted ceiling covered in Select Veneer Douglas fir panels and doors that open to a private deck. 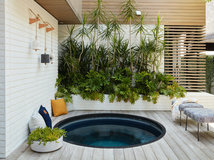 The homeowners wanted to be able to sleep under the stars on nice nights, so Fung had the seagrass bed put on casters. 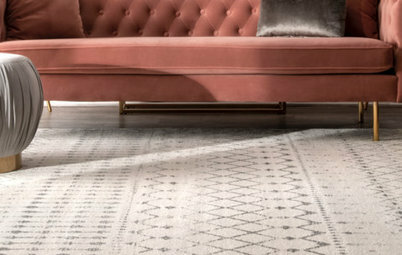 A flat dhurrie rug allows the bed to be rolled easily. Look back to the fire pit photo to see the deck’s location on the end of the house. 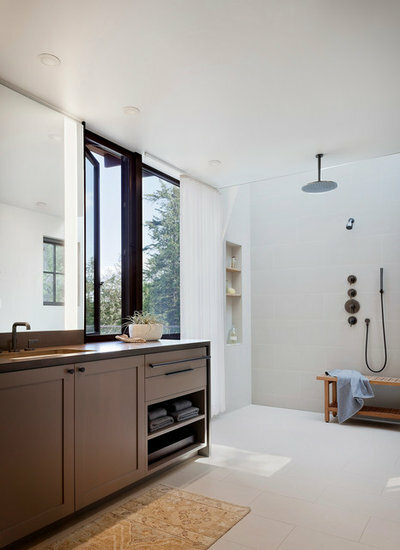 The master bath has an open shower with expansive views of the trees. A sheer curtain provides privacy. 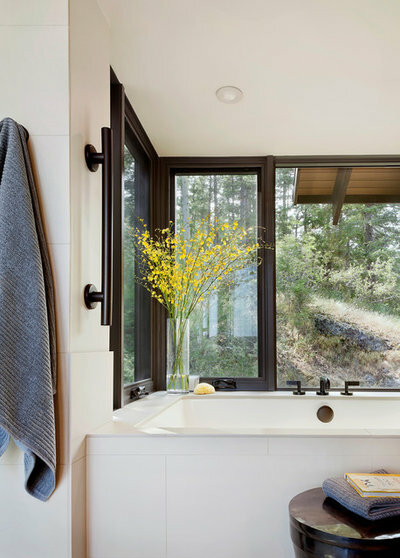 The large soaking tub also has expansive views of the forest. Attention to subtle details keeps the bathroom feeling open and stylish — the 12-by-24-inch tiles with minimal grout lines in a matching color create a smooth and cohesive look. And even the grab bar is well integrated with its dark finish that matches the oil-rubbed bronze faucets and black window frames. This spot, complete with eight bunks, is the most camp-like room in the house. Select Veneer Douglas fir panels add to the rustic vibe. 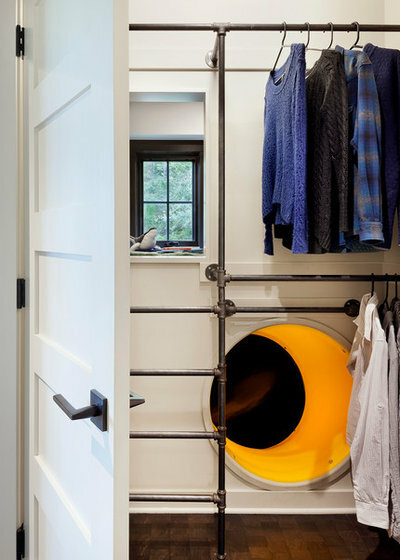 Check out the clever ways in which niches, drawers, shelves and cabinets are integrated into the design — they provide storage for clothing, linens, books and other items. 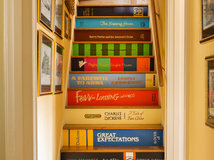 The designers also outfitted each bed with a reading light and a niche for books, glasses and a drink. A large custom sliding barn door opens to the children’s bathroom, Note how the snow fencing is used as wainscoting on the left. This was for durability as well as aesthetics. The bathroom has another custom powder-coated sink, this time in a trough shape. There are two fun surprises in the kids’ closet that meet the discovery, exploration and play goals discussed in the initial family workshop. One: the secret fort at the back of the closet, accessible by a rod-and-ladder system composed of pipes. Two: the mysterious yellow hole. It’s the opening to a spiral slide that leads to a ball pit. When can I move in?! 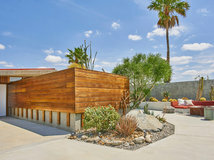 This is one of the most nicely finished homes I’ve seen in sometime. Warmth and sophistication. Great job! Stunning! Well done Architects and Interior Designers !! Great Job !